Discussion in 'Lighting and Electrics' started by mrb, Mar 30, 2009. I see source 4 ERS fixtures being used outdoors for a month or more during christmas season for gobo projection. What is the best way to go about this? Keep them relamped and alive for as long as theyre outside, then when we get them back strip them down to clean out dead bugs, and replace socket if corroded? Awhile back I spoke to Spencer at ETC about that, and he said that outdoor use is typically not ideal. That is, prolonged outdoor use without protection from the elements. If rain hits your lamps while they're hot, they'll explode or simply die faster than they should. The lenses will also tend to get cloudy and moving parts may not move so well. With snow, you have the issue that fixtures outdoors may accumulate snow which may trickle into the socket assembly and reflector housing and cause lamps to explode, short out, or corrode. The overall summary being that outdoor use is fine, but make sure you take care of your fixtures and try to keep them shielded as best as possible from the weather. An outdoor theatre in Spring Green, Wisconsin, the American Players Theatre, is notorious for leaving their fixtures outside and unprotected from the weather, despite ETC's pleas to come up with a solution which provides some kind of roof or housing structure to keep them safe. Overall though, it depends on the scenario in which the lights are being used. Depending on that, some situations may warrant custom housing structures while others may not. Mind you, just because you can plug your Source Four into a socket and throw it into a pool doesn't mean that it's a good idea or will work well. If your fixtures are caught in a downpour or warm up that accumulated pile of snow on top of them, the same rules of physics apply for electricity and heat energy. Tempest Lighting if its only one fixture this might do it for you. Some form of Tempst dome or dog house for them is preferred and even after that, expect anything especially not plated or that's black oxide coated to rust. After the production if only humidity, everything will need cleaning if not especially the clamp and it's bolts solid rust from just moisture. The fixture itself is not rated for exposure - simple enough. Lamp most likely ain't gonna explode unless what rain gets to the lamp which has not already evaporated before it gets to the lamp directly drips on the lamp and the lamp ain't hot enough to instantly vaporize it. Have to be a very heavy rain or moisture for this to happen. Recently remember a lamp manufacturer toughting lamps which by way of moisture will be as it were more resistant to shorting between pins. Never really bought into that concept in that if it gets wet enough it ain't the gap of the heat sink between pins as much conducting in absorbing moisture, it's the water in the fixture itself creating the short but it is a noted thing for if I were to do an outdoor fixture without protection..
Can happen. After that, light mist or rain I would seriously doubt will be cause for a problem. Downpoor and everything becomes a potential problem. After the weather, strike and clean all. On the other hand, I kind of doubt these fixtures are rated for it so it's no doubt a good idea not to do it. We use source 4's in our amphitheatre. They're out in the elements for a solid 3 to 4 months before I take them down, at which point, they get a full tear down, cleaning, and bench focus. The most difficult aspect of this, is that I need to periodically repaint the fixtures but that's after 6 to 10 years weathering. I've never had any lamps explode from exposure to the elements. Granted, my equipment is up and running during the summer months, but my venue is located a quarter mile from the pacific ocean, so I do have humidity and salt air to contend with. The point, though, is that as long as you are diligent about your maintenance, your Source 4's should hold up just fine. I think you missed the point of what Mike was saying about exploding lamps. What makes lamps (or reflectors for that matter) explode isn't as simple as water + lamp = explode. What would cause a lamp to explode would be the rapid contraction that happens when hot things (a lamp that's been running for a while) come in contact with relatively cold things (snow that melted down the barrel, that rain storm that just started, etc...). If you've never decided to see what happens when you take a spray bottle full of water and spray a light bulb that's been on for a while, I assure you it does in fact blow up. What the lights in your outdoor venue are probably experiencing is more a situation where any moisture in the fixture is more of less the same temperature as the lamp when you turn it on initially, it will warm with the lamp as it is used, and after use cool slowly with the rest of everything in the fixture. No instantaneous change in temperature, no rapid contraction, no explosion. The fact that the water and the lamp don't change temperatures at the same rate is probably detrimental to your lamp life but that's not what we're talking about right now. As far as how I would project a gobo outside for an extended period of time. I'd probably build something to cover the actual fixture with a hole in it that I would focus the light through and let the light emitted by the unit melt any snow build up that would occur. The tempest stuff is an all out way to go but probably a bit expensive for a light meant to spread holiday cheer. EDIT: After re-reading ship's post I decided to mention that I don't think that in most situations exploding lamps would be a concern. But if you are expecting any kind of downpour or blizzard like conditions I'd turn your lights off. No one will be appreciating them anyway cause of the crappy weather and it will protect you from this possibility. 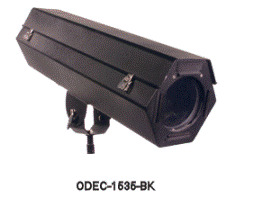 Or you could use an ellipsoidal reflector spotlight that is designed for out door usage. Well, that takes all the fun out of outdoor lighting. We use Source Four lekos outdoors in our Shakespeare Festival space. They're just your garden-variety Source Four lekos, but they do the job. As cdclub said, we also take our fixtures down at the end of our summer season and strip/clean/bench focus them...it's just part of our normal strike/load in process for the space. I have a really similar situation up in the Bay Area, our theatre operates outdoors between May and October, and have a lot of clean up to do after the season. I have been looking some type of rust proof bolt for the c-clamps, especially the pipe bolt. Wondering if you've ever experimented with zinc-plated steel or stainless steel for bolts and if not, whether you have any other ideas for outdoor proofing all parts of the instruments.